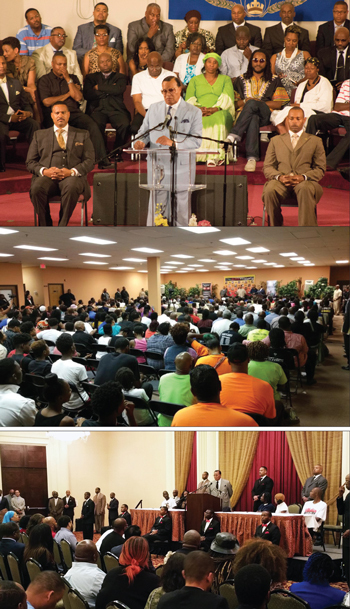 The Honorable Minister Louis Farrakhan traveled across the United States during the “Justice…Or Else!” national tour. Two decades ago the Honorable Minister Louis Farrakhan of the Nation of Islam convened the historic Million Man March in Washington, D.C., the largest mass gathering in the history of the United States and perhaps the largest gathering of Black men in world history. Min. Farrakhan with the people of Ferguson, Missouri. “Justice Or Else!” is the poignant and powerful theme as Min. 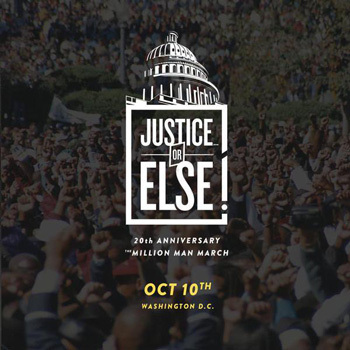 Farrakhan convenes the 20th anniversary gathering October 10, 2015 in the Nation’s Capital. Twenty years later, with the world engulfed in turmoil, Min. Farrakhan returns to the seat of government for the world’s sole superpower and represents a universal cry for justice heard echoing across the globe. Surrounded by faith leaders, young leaders and thousands of supporters and activists at Metropolitan AME Church—just five blocks from the White House—Min. 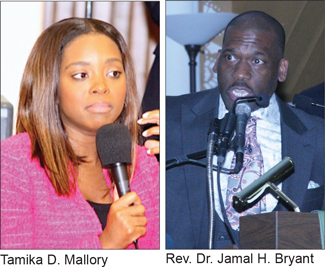 Farrakhan officially announced the 20th anniversary commemoration along with organizers Tamika D. Mallory and Rev. Jamal Bryant on June 24. “We are at a place now where history is meeting with the circumstances of the time to create events that will lead us to the destiny that God determined. The question is, what is the Will of God for us today?” Min. Farrakhan asked. The Muslim leader continued to set the tone and purpose for October’s gathering during a whirlwind national Justice Or Else! tour where he addressed Blacks, Latinos, Native American and Indigenous communities and various religious faiths. In each city, he spoke to three and sometimes four separate audiences, met with youth and clergy and local artists. During stops, Min. Farrakhan also met with and comforted family members of Tamir Rice, Eric Garner, Malissa Williams, Timothy Russell, Michael Brown Jr., and others who have endured pain and suffered from their loved ones being shot down and abused by law enforcement. “Justice and equity cannot wait any longer and in October we will remember those killed in Charleston, S.C., those killed before Charleston and those killed in fratricidal violence in the Black community,” said Min. Farrakhan. In the weeks prior to the announcement, Min. 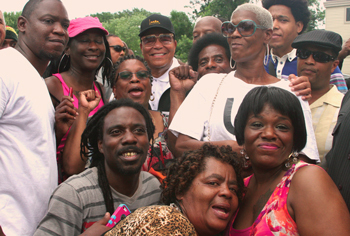 Farrakhan engaged and inspired thousands of leaders, activists, pastors, youth, advocates, hip hop artists and entertainers in seven cities around the country in support of the march. Starting in Washington D.C., the Minister initiated an east coast tour in early June with stops in Philadelphia and New York to promote and begin organizing for this vital event. Everywhere the Minister spoke, large enthusiastic crowds welcomed him. The Minister’s themes in Chicago reflected similar themes from messages delivered on the eastern leg of the tour that focused on the need for concerted economic action and withdrawal, as advocated by Dr. Martin Luther King Jr., the power of Black unity and the opportunity to seek justice for Latinos, Native Americans and even poor Whites. The Nation of Islam minister spoke passionately and frankly to a crowded ballroom in Chicago at Salaam Restaurant, warning that the American system and world governments have failed. These governments are ruled by Satan and cannot bring into reality what the people desire and want, he said. Slave labor made America rich, Blacks have fought in every war only to be lynched in uniform while immigrants benefited from the wealth of a country forged out of the destruction and oppression of Black bodies that never enjoyed freedom, the Minister explained. Then today Blacks are shot down almost daily and the federal government is too weak and corrupt to protect the lives of Black people, Min. Farrakhan continued. Leaders across all points of the ideological spectrum from grassroots, religious, political and student organizations gathered June 15 in Houston to receive guidance from the man who speaks as the voice of the oppressed crying out for justice. There, he told the crowd that Justice Or Else! has become a rallying cry but it also serves as a threat. Min. Farrakhan said this call is not for the faint of heart, it is for the stouthearted. (Top to Bottom) Mercy Memorial Baptist Church in Milwaukee, Wisconsin. | Large numbers of youth came to hear Minister Farrakhan at a community center in Milwaukee. | Leaders across all points of the ideological spectrum gathered June 15 in Houston, Texas to hear from Min. Farrakhan. Two days later in Los Angeles, he met with community leaders. The June 17 meeting, held at Holman United Methodist Church, was hosted as part of a special Urban Issues Breakfast Forum. A diverse coalition of clergy, grassroots activists, street organizations, educators, gang interventionists, homeless activists and entertainers were among the more than 1,500 present. “This is not a Million Man March. That’s what was! This is a movement of human beings for Justice Or Else!,” declared Min. Farrakhan. We need to boycott Xmas holiday spending as part of demands for addressing the crisis in Black America, the Minister declared in every city he visited. Before he was assassinated, Dr. King called Black people to a duty that they never talk about since his death of ‘re-distributing pain’. Pain for the lack of justice, tyranny and lack of fair dealing, Min. Farrakhan explained. In the last year of his life, Dr. King spoke strongly about the failures of America, the reality of racial intransigence, economic boycotts and the criminality of White society and Min. Farrakhan challenged audiences around the country to begin to study the speeches the civil rights leader gave in the last two years of his life. On July 7 he spoke an inspirational yet direct message to Baptist clergy and laypersons at Spirit of Truth Missionary Baptist Church on Chicago’s west side and spoke to their critical role in Justice Or Else! and their responsibility in the spiritual resurrection of the human family particularly the youth. When he stepped up to the rostrum at New Sunny Mount Missionary Baptist Church July 17, in St. Louis Min. Farrakhan was greeted with a rousing standing applause from the capacity crowd inside the main building. The Minister was in the St. Louis and Ferguson areas for less than 72 hours but in that time, he energized the people with informative messages of strength and guidance which touched all portions of the area’s Black community. Ferguson became ‘ground zero’ in the sparking of nationwide protests against police brutality touched off by the fatal shooting of unarmed teen Michael Brown Jr. by White police officer Darren Wilson on August 9, 2014. On July 18 the Minister laid a wreath on the spot where Michael Brown Jr.’s body laid for over four hours. When he stepped before some 1,500 people packed into the historic Mt. Zion Baptist Church in Miami on July 30, the crowd exploded with applause. There he explained the October gathering will be no frolic, no picnic, no folly, but a serious demand for justice placed before a government rife with injustice and a crisis in police killings of Blacks, Native Americans and others inside America. Such a demand called for an assessment of conditions and confronting White oppression on one side and Black fratricidal violence on the other. Later in his message, the Minister called for 10,000 fearless men willing to make the ultimate sacrifice rather than live under tyranny. There comes a time in the life of every people who yearn for freedom where death is sweeter than to continue life under oppression, he said. Blacks must protect their lives if the federal government refuses to intervene when Black lives are killed unjustly and the principle of a life of a life is laid out in scripture, the Minister explained. August 6, he was back in Chicago speaking to clergy and business leaders at the historic Fellowship Missionary Baptist Church. Next, the Minister was in Harvey, Ill. a Chicago suburb where he spoke Aug. 11 to students, parents and the community at Thornton Township High School. August 12-13 stops in Milwaukee and Glendale, Wisc. saw the 82-year-old leader speak to standing room only crowds at Mercy Memorial Baptist Church and the Fresh Start Counseling Services Center. At the center, when Min. Farrakhan saw the smiling faces of Black and Latino youth, male and female, mostly in their teens and early 20s, he smiled. The Minister masterfully connects with the youth and explained how Justice Or Else relates to them as future leaders and rulers. “This is the time for you to advance intellectually and make choices for your life that will impact not only your generation but generations to come, and this is why the enemy does not want the youth to connect to wisdom,” he told them. A capacity crowd packed the Cannon Center for the Performing Arts to hear Min. Farrakhan speak to those living in the Mid-South region. 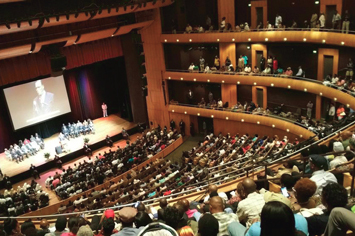 All 2,100 seats on all three levels of the main auditorium in Memphis, Tenn. were filled Aug. 20. There, he forthrightly addressed his critics and mischief-makers in the media who mischaracterized his words on the Law of Retaliation found in both the Bible and Holy Qu’ran. To overcome tyranny, the Black community must have a serious mind and a willingness to sacrifice and defend itself from unjust killings, if government will not act, said Min. Farrakhan. Prior to the delivery of this message in Memphis, the Minister was led on a private tour of the National Civil Rights Museum at the Lorraine Motel, where Dr. King was shot down on a balcony by an assassin’s bullet April 4, 1968. The lines began to form early August 25 as hundreds filed into Fellowship Chapel Church in Detroit. Although the Minister had not been feeling well due to a cold he had been battling, he greeted a capacity crowd with a broad smile. An overflow room equipped with a huge screen enabling viewers to see and hear his message was also full. As in previous cities, the Minister met with the cultural artists, the entertainment community, and the spiritual and political leaders from around the Detroit metropolitan area in back to back meetings the day prior. When Minister Farrakhan visited Cleveland, it was a stop in a place that has experienced perhaps two of the most well-known incidents of the blatant disregard for Black lives in recent memory. “Tamir Rice has to be answered for! Malissa Williams, Timothy Russell have to be answered for,” Min. 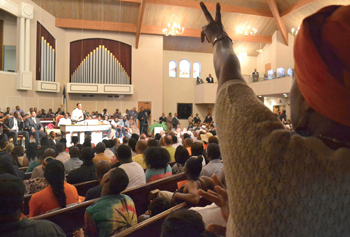 Farrakhan told nearly 2,000 people packed into Second Ebenezer Baptist Church Sept. 3. He was referring to the November 22, 2014, killing of young Tamir Rice, 12, who was playing in a park near the Cudell Recreation Center with a toy gun when he was shot and killed by police. The Minister shared words at memorials erected for Tamir, Malissa and Timothy. Back in the ‘City of Brotherly Love’, Sept. 8, residents packed the Tindley Temple United Methodist Church responding with great spirit and enthusiasm to a call to stop violence, restore order and return a sense of community and love to Black neighborhoods suffering from drugs, crime, violence and upheaval. Despite his desire to pay respect to the nine slain parishioners of Mother Emanuel AME Church in Charleston, S.C. and speak to the community there, Min. Farrakhan’s planned Sept. 14-15 visit there was cancelled. Organizers blamed fear and stated there were consistent denials for use of facilities like schools, churches and other venues normally open for public events and speakers. However, the Minister did address members of S.C. street organizations via webcast Sept. 14, appealing to the young leaders to make peace. He stressed the senselessness of gang warfare and fratricide as senseless often times over nothing. Min. 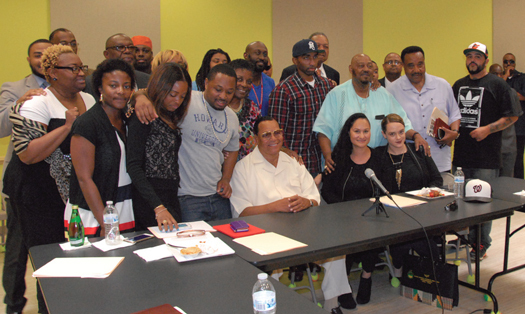 Farrakhan wrapped up the tour in Chicago. The evening air was charged outside the Emil and Patricia Jones Convocation Center at Chicago State University. Inside 1,700 people gathered to hear the outspoken leader deliver the critical message of Justice Or Else! During his Sept. 17 message, the Minister answered many unspoken questions on the minds of those in attendance and he sealed further support from those who yearn for change. Sept. 18, his last tour stop was a powerful and unifying message at a program presented in both English and Spanish to the Latino and Indigenous communities where the call for Justice Or Else rang loud and clear at Lincoln Methodist Church in the city’s Pilsen neighborhood.